Welcome to Spane Buildings, where we’ve perfected the art of constructing post frame and pole barn buildings. For more videos, and images of some of our projects, visit our Blog Page, or our Videos Page. Since 1945, Spane has been constructing some of the finest horse arenas, private residences, commercial structures, barns and garages, throughout Skagit, Whatcom, Island, Snohomish, King, Pierce, and Thurston counties. At Spane, we build more than structures; we build life-long relationships with our customers. Our exceptional craftsmen have built thousands of such structures, backed by our 100% workmanship guarantee. 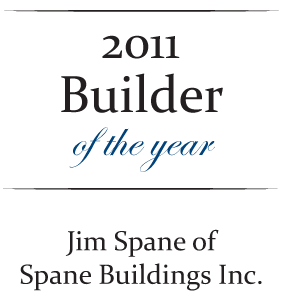 We were recognized as the “2011 Builder of the Year” by our peers with the Skagit and Island Counties Builders Association (SICBA); a proud achievement in the Spane family. When considering your next project, look no further than Spane Buildings,the Northwest’s most trusted and experienced builder of post-frame buildings. We invite you to call (360) 424-1505 today or email Jim Spane so we can help you. Click here to view our catalog. We look forward to working with you on your next project.